"Samantha amazes with her ability to weave captivating stories in melody and rhyme. She breathes life into characters and situations one remembers long after the song has ended." "If I Were a Bottle" Takes First Place in American Songwriter magazine's September/October 2018 Issue's Lyrics Contest. Click Here for the Lyrics and Click Here to Read the Q & A with Samantha about penning the tune and songwriting in general. NEW SHOW!!! Catch Samantha Elin this weekend with The Knobby Knees in their ode to 20th-Century classic songs. They are the seekers, the dreamers, men and women with hearts full of longing for something or someone. These ordinary but somehow grand characters reside in Samantha Elin's songs, amidst a musical landscape of alternately catchy and somber folk, country, pop, rock, blues, and styles in between. 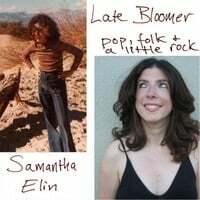 A California-based songwriter/singer, Samantha's songs are brought to life by some of L.A.'s top session and live players, e.g., John Palmer (Chuck Berry, Wanda Jackson); Bob Gothar (Micky Dolenz, J.D. Souther); Don Heffington (Bob Dylan, Emmylou Harris); Carl Byron (Jim Lauderdale, Anne McCue); and Dan McNamara (Brian Wilson, Roger McGuinn). She sings some songs herself and has turned to some of the best--like Nicole Gordon, Hirth Martinez, and John Cowsill--for others. 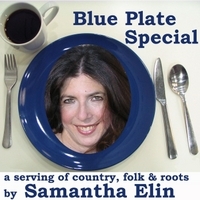 AVAILABLE ON ITUNES, AMAZON, CD BABY: LATE BLOOMER, 12 songs that run the gamut from Tin Pan Alley to pop, and BLUE PLATE SPECIAL, a 14-song album of eclectic folk and country. Click here for more information.